Using the financial planning data that you provide, we create the client’s Critical Path, run a historical audit and provide the historical probabilities of success for the proposed financial plan and investments. By showing investments in the context of the financial plan, the feasibility of the client’s goals are shown in a historically significant manner, which may allow you to keep, or get your client on track. 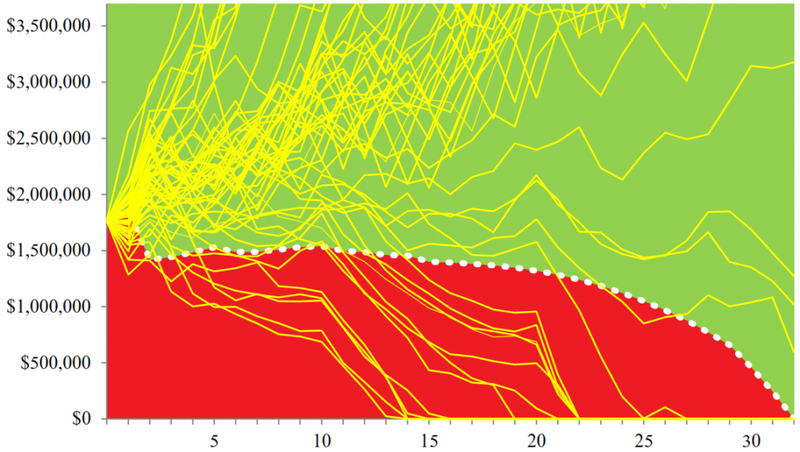 Below are some charts and tables that we typically include in our Critical Path proposals. In each proposal, our goal is to show you if your client’s proposed portfolio is realistic or if planning changes need to be made. To show how realistic the proposed financial plan may be, we create the chart shown. 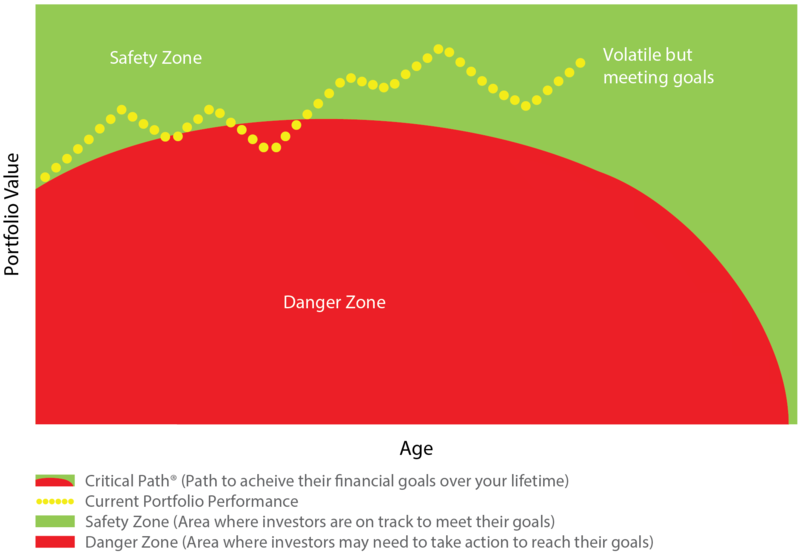 In the chart, the white dotted line shows what needs to happen for your client to meet their goals, and the yellow lines show how a representative strategy performed during every longevity-matched period going back to 1927. 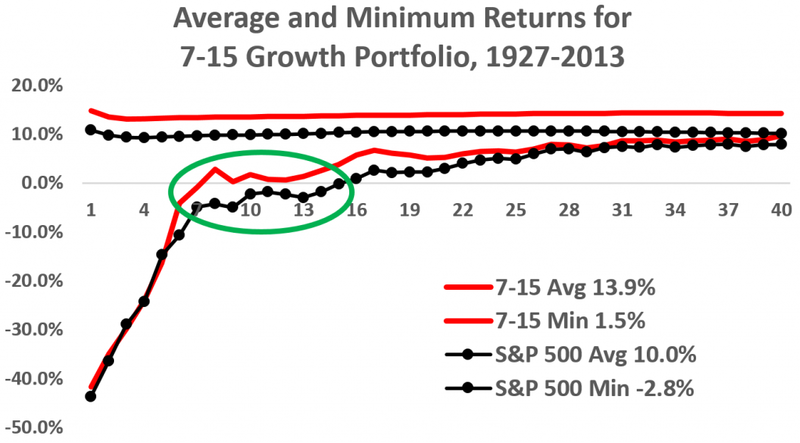 For scenarios that fall short in the chart, no adjustments (like reducing withdrawals or changing asset allocation) were made to prevent early depletion. As part of the client’s annual Critical Path review, we provide you with recommendations to help keep your clients on track to meet their financial goals. The chart uses historical index data from a number of providers to create a historical audit for a sample client’s portfolio. An historical audit is a method for back-testing performance with the benefit of hindsight. Back-tested performance is provided for informational purposes only and does not represent actual performance. It is strictly hypothetical. Actual performance may have been materially lower and future performance may be materially lower. Results also do not reflect actual trading and market factors that could have impacted a client’s or Asset Dedication’s decision-making process. The dataset range is 1927 to 2013. The primary sources are: Center for Research in Securities Prices (CRSP), Fama/French Research Database, Dimensional Fund Advisors, MSCI, Ibbotson Associates and Global Financial Data. Some datasets have been extended using multiple regression analysis. To further show how realistic the proposed financial plan may be, we include this table to show the expected returns for the proposed portfolio and the corresponding probabilities of success over all longevity-matched time-spans back to 1927 and 1947. By looking at returns during the dawn of the Great Depression and the Post World War II era, our goal is to provide you and your client’s with more perspective into the potential longevity of the proposed portfolio. Once you and your client have defined the client’s Critical Path, we begin investing with the goal of delivering a representative portfolio. Below is an example of how we may have implemented a client’s portfolio. Before building the growth portfolio, we purchase fixed-maturity income securities that match the client’s projected account-specific spending needs. Doing so, our goal is to protect principal and give the client flexibility to ride through down markets without having to sell their growth securities at a discount. Click here to learn more about the income portfolio. 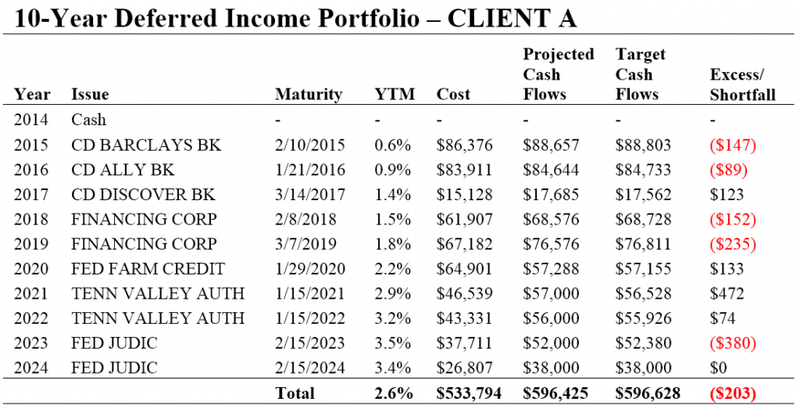 The table shows securities that we may have purchased in an attempt to match cash flows to a client’s future spending needs. .
We typically time-align a client’s Income Portfolio with their Growth Portfolio with the goal of improving the client’s probability of reaching their time-based goals. For example, if a client has income securities that are projected to meet the next ten years of their spending needs, we may purchase a growth portfolio that is designed to maximize their minimum returns over a 7-15 year time horizon. The chart uses historical index data from a number of providers to create a historical audit of the S&P 500 and the weighted underlying asset classes that Asset Dedication attempts to replicate in the 7-15 year time-targeted portfolio. An historical audit is a method for back-testing performance with the benefit of hindsight. Back-tested performance is provided for informational purposes only and does not represent actual performance. It is strictly hypothetical. Actual performance may have been materially lower and future performance may be materially lower. Results also do not reflect actual trading and market factors that could have impacted a client’s or Asset Dedication’s decision-making process. No matter how positive historical audits have been over any time period, the potential for loss is always present due to factors which may not be accounted for in the historical audit. The nature of a back-tested audit creates the potential for a financial professional to select superior performance results in order to get the desired audit results. The dataset range is 1927 to 2013. The primary sources are: Center for Research in Securities Prices (CRSP), Fama/French Research Database, Dimensional Fund Advisors, MSCI, Ibbotson Associates and Global Financial Data. Some datasets have been extended using multiple regression analysis. After implementing the portfolio, we send you an annual Critical Path report that shows where the client is relative to their Critical Path along with recommendations that are intended to improve the financial plan’s probability of success. If your client is thinking about making a change to their financial plan, we can create a modified Critical Path that shows the potential impact that the proposed change may have on their ability to meet their long-term planning goals. By showing the potential impact of any proposed changes, the Critical Path® may allow you to understand if your client can adopt the proposed change while maintaining the integrity of their long-term planning goals.